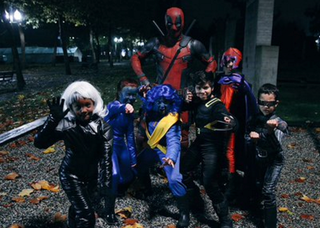 Ryan Reynolds Trolls Pint-Sized X-Men In "How Deadpool Spent Halloween"
Ryan Reynolds dressed up as Deadpool for a Halloween video in which he tries to unite a motley crew of kid X-Men, Deadpool-style. The video is a promo for Reynolds’ Deadpool movie (which comes out in February), and the actor doesn’t break from full-on Deadpool—meaning he’s foul-mouthed, sarcastic and super-talkative. The video, which Reynolds tweeted as “Deadpool’s school for not so gifted youngsters,” is fun as far as promotions for blockbusters go. If this is any indication of Deadpool in the upcoming film, he’s going to be a handful—but that’s how we like our Deadpool.